Composting is nature's process of recycling decomposed organic material into a rich soil, called compost. By composting your organic waste you are returning nutrients back into the soil in order to make rich soil to grow healthy plants. Finished compost will look like dark brown soil, will be crumbly, and smell like a forest floor. A great variety of things can be composted at home, saving them from a one-way trip to the landfill, and turning them into a valuable soil amendment for home use. 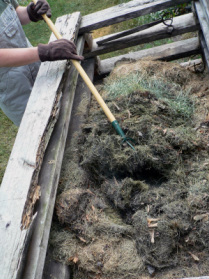 The following items and more can be added to your compost pile: grass/lawn clippings, hay, kitchen waste, leaves, straw, weeds and other garden wastes, and wood chips and sawdust. Some items can be bad to your compost and make your compost a bad soil. The following items and more shouldn't be added to your compost pile: chemically-treated wood products, diseased plants, human wastes, meat, bones, fatty food wastes, pernicious weeds, and pet wastes. For anymore questions visit http://vegweb.com/composting/and good luck composting!